Gerald Nosich discusses strategies for teaching critical thinking through subject matter courses. Good for all levels of education. Topics include: critical thinking as “thinking things through,”reasoning about basic questions, evaluating arguments and explanations, and four questions students should always ask. 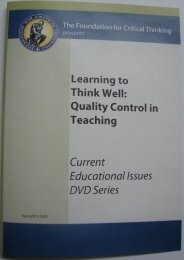 315DVD Learning to Think Well: Quality Control in Teaching (DVD) $9.95	 Qty.